Custom Write-On Key Tags Personalized in Bulk. Cheap, Promotional. Car, Tooth, Heart, Van, Rectangle, Bandaid shapes. Lowest Cost in USA and Canada. Optional Split Key Ring or Ball Chain. Bulk custom imprinted plastic write-on key tags with optional split key ring or ball chain. Ideal auto dealer key tag. The back can also be used for personal data. Free artwork design. We will send you a proof for your approval before production. 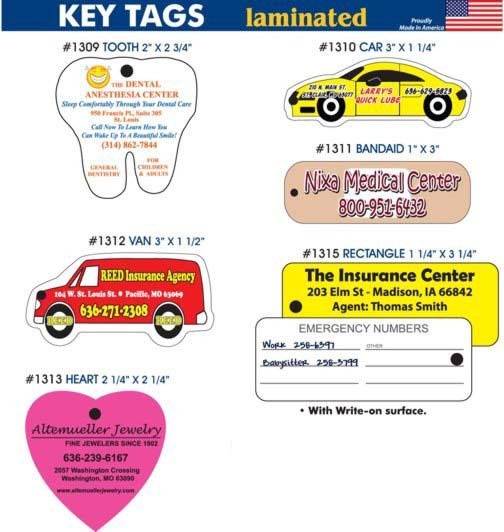 Budget Prices in USA and Canada for custom write-on key tags. Material: Sturdy Plastic 0.30" (30 mil.) thick. Write-On Surface on the Back; the matte lamination on the back prevents smearing. OPTIONS: Split Key Ring: $0.05 packed bulk (not assembled); Ball Chain: $0.05 packed bulk (not assembled).